The Italian anarchist Angelo Galli had his life terminated abruptly, yet he stills lives on through the masterpiece of Carlo Carra, The Funeral of the Anarchist Galli, pictured below. Much more research needs to be done on this well-dressed young anarchist. He was born in 1883. 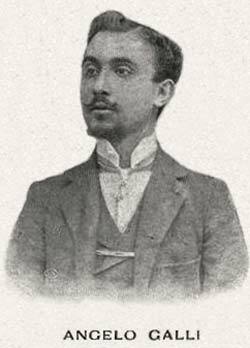 In the anarchist paper La Protesta Umana he is refered to as “a great gentleman of the Ideal, a soul pulsing with the pain of the world..not educated, but remarkably intelligent..eager for action” (1).On May 6th 1906 the Royal Guard in Milan fired on a group of workers, killing one and wounding eight. As a result a general strike was declared in the city. Galli was heavily involved in organising the strike. On the morning of the 10th of May he went with fellow anarchists Enrico Recalcati and Carlo Gelosa to the Macchi and Pessoni factory to set up a picket and to intercept scabs. The factory security guards, armed with daggers, attacked the trio and Gelosa was injured and Galli was stabbed to death. The ensuing funeral of the murdered anarchist three days later was a stormy event. The funeral cortege was led by fifteen huge red and black flags. Violent clashes broke out between workers and carabinieri. As the cortege proceeded from the morgue to the Musocco cemetery. Mounted police charged the procession which included children as well as women and men. There were several casualties. The Italian futurist painter Carlo Carra, then an anarchist , with strong links to the Milanese anarchist movement, was caught up in the event. It was still very much in his memory when he conceived the idea for his famous painting in 1910 and which was completed in the following year. It was shown at Futurist exhibitions in 1912. Later with the rise of fascism, Carra moved away from anarchism and became close to the Mussolini regime. Galli lies buried in the Musocco cemetery not far from the memorial to the 400 Milanese workers gunned down in 1898, following riots over food price rises and famine in Italy.